From left, Charles Bradley, Peggy Eagan, Joan Kennedy, Dr. Marcus Plescia, and County Manager Dena Diorio. County Manager Dena Diorio used today’s Forum visit to showcase the work of a number of county departments, and to introduce to a wider audience the people tasked with leading those efforts. In the order in which they spoke, the speakers were Dr. Marcus Plescia, County Health Department; Joan Kennedy, Child Support Enforcement; Peggy Eagan, Department of Social Services; and Charles Bradley, Youth and Family Services. Community relations manager Christine Edwards sat in the audience and did not speak. 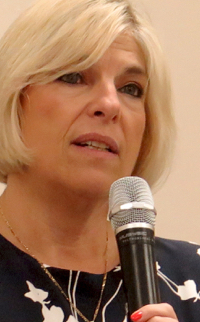 In her opening comments, Diorio directly addressed several other matters. CMS budget: Diorio acknowledged that the schools have annual budget needs. But what CMS wants, she said, is essentially all the new money that Mecklenburg County will have next fiscal year. CMS bonds: The schools also have needs for additional capital spending, Diorio said. But even if it could, the county is unlikely to rethink its bond payments strategy this year, so school bonds must wait until 2017. Second Ward gym: The project to refurbish the last remnant of the segregated black high school that was destroyed along with the neighborhood surrounding it during urban renewal is fully funded and may be completed within 12 months. C.W. Williams: Commissioners and county staff have been supportive of C.W. Williams Community Health Center during its recent bankruptcy. Diorio said the county forcing the center to achieve benchmarks in order to receive county money helped lead to the center’s new direction. She said some money would continue to be held in contingency for the next year pending proof of continuing to achieve financial and service benchmarks. In the video below, the main presentation begins at minute 9:30. Following the presentation is an extensive Q&A. In her presentation, Ms. Kennedy refers to a two-page handout showing residential locations of custodial and non-custodial parents tracked by Child Support Enforcement, by county commissioner district.